It's easy to be a voracious writer when you get to do fun writing projects such as this! Second graders got to chew up some gum, blow some bubbles, and then teach us how to blow a bubble! Mrs. Smith, a student teacher in Mrs. Galt's class helped them with this fun activity! Karson Oyler, a first grader at Riverview, won 3rd place at a State Chess Tournament recently. 66 first graders competed . Karson played 6 games and won 5 of them! He is very proud of his trophy, and we are all very proud of him! Great job Karson!!! 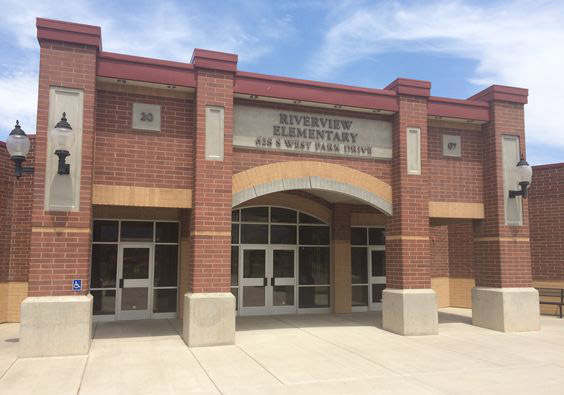 Riverview held its first-ever art show for the parents to see at SEP night. The entries that students turned in were of such high quality, it was amazing! One can tell that there is a lot of fun technique and learning going on when it comes to the arts at Riverview! This will be an annual event, we're sure! We DO Like Green Eggs and Ham! Dr. Seuss Day Reading Celebration Mrs. Price's Kindergarten! Their class had a great time discovering if they did or did not like green eggs and ham.... and by the look on Briley Hupp's face- we think it's "like!"